Travelling is a wonderful time for laughter, bonding and festivities. An opportunity to learn new things, see different cultures and connect with different people. Whether it be on the beach, a new city, trekking on the mountains or star gazing in the wild, traveling is one of the best de-stressors when you need to take a time out. And what better way to spend it with your family. Yoga props don’t consume too much space in your luggage, just bring your mat with you! A big travel mat rolled on your bag would indeed serve as a reminder that it’s time to squeeze in some exercise hours on your vacation but it might just add up a wee amount of weighing. One Lululemon yoga mat review from a renowned yogi indicated that lightweight travel mat fits perfectly in her travel bag and added only about 1 kg. Add that to the fantastic view of your beach or the mountainside and you have an instant inspiration as you execute your downward-facing dog pose. Take in a deep, deep breath of fresh breeze while you’re at it. As with any travel bit, exploring the local yoga studios are part of the vacation itself. Your hotel might just have their own yoga studio for you to enjoy. Perhaps, you will find a Yogi instructor giving free classes on the town’s plaza where you can meet other families practicing yoga themselves. Or maybe there’s a studio beside the famous restaurant you are dying to try. In any case, search for Yoga practice opportunities before you travel. So, your youngest wants to go to the waterpark and your eldest wants to check out the museum; your hair is thinning out at the thought of having not enough time to go to all of these places but you want everyone to be happy, too. Well, the best plan is to make a plan. Find time before your travel to search for the noteworthy tourist’s spots, find the perfect schedule and you’re good to go. While you’re at it, keep an eye out for opportunities to practice yoga as well. Have you ever considered going on a retreat? How about a yoga retreat for your next vacation? Morocco, Thailand, and Cambodia offer yoga retreats all year round. 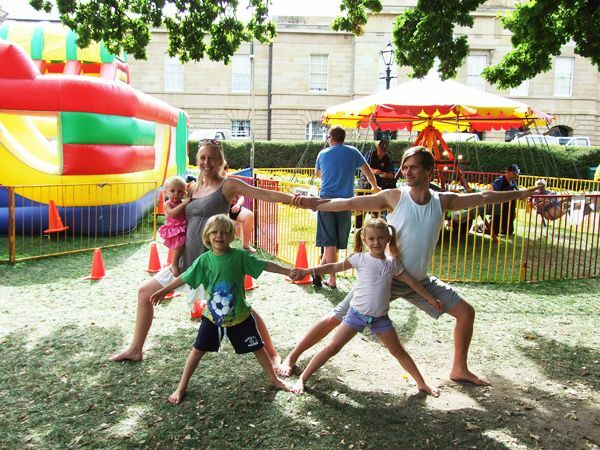 Some even offer a family yoga retreat which teaches you poses that can practice your little kid. Not only is this a good husband and wife quiet time, but it can also be one of the most memorable bonding experiences you will have with your children. Do not be intimidated by silent yoga retreats as this is a whole new level of experience altogether. Travelling, though enjoyable for everyone, can also be quite tiring. Take a few minutes out of your day to just practice your breathing. The best times are when you are waiting for your flight, aboard your plane and while traveling on land to your destination. It need not be a complicated practice as you can just sit there, block the surroundings and just breathe. You can turn it into a game for your kids, everyone will enjoy it. Yoga is a cleansing of the mind, spirit and the body. Make sure you get your daily, if not weekly, dose of it. And while you’re at it, take advantage of your time while on vacation; reset your body by getting that 8 hours of sleep. Pick your food thoroughly– an option you don’t usually have when you only have an hour for lunch at work. Do some light reading. Anything that would help you reach that state of relaxation where both your mind and body is at rest. Be it on vacation or at the comfort of your own home, there’s plenty of yoga to go around. Share the experiences with your family and new friends, ask them to join and eventually, build a community of yogis eager to practice even when they’re away from home. If your kids love to take an active part in sports, that’s awesome! Playing games encourages the development of discipline, team spirit, and sportsmanship. Above all and most important, it cuts back on the time kids spend with devices. However, playing sports carries the very real possibility of injuries. While acute sports injuries are commonplace, chronic injuries can affect the growing musculoskeletal structure of a child’s body. In the year 2012 alone, more than 1.3 million kids reported to the emergency room with sports injuries ranging from ankle sprains, ligament tears, and head trauma, among others. As a parent, you must do the best you can to protect your kids from such injuries. And, since they are unavoidable, use the best treatments possible to help them recover quickly and get back in the game, one of them being PRP treatment for sports injuries. Avoiding getting sports injuries is always preferable than treating them and going through the long and sometimes, difficult rehabilitation process. So, what you can do to help prepare your kids for playing sports? Make sure your children have all the protective gear they needincluding knee guards, elbow pads, helmets, and shoes with proper grips, to name a few. Talk to the coach for information on the right kind of gear that can help prevent sports injuries. While your kids might have a particular interest in a specific sport, having them play different games can help lower the risk of chronic injuries. Think baseball, soccer, lacrosse, football, and basketball. Talk to the coach about having your kids practice a range of different movementsso that repetitive motions don’t stress a particular joint. If your children are playing a single sport all through the season, make sure you get them physical therapy to prepare their bodies before the start of the season. Before the academic year begins, kids go through the preseason physicals to assess their fitness levels. Depending on the sport they’ll play, request your pediatrician to take a close look at their muscles and joints. For instance, if your child has been preparing to pitch in a baseball game, have her shoulder muscles examined thoroughly. But, if she’s on the cheerleading squad, you’ll need to pay particular attention to her lower back and core muscles. Talk to your kids about the importance of warming up their muscles before playing a game to prevent sports injuries. Warming up can include dynamic and static exercises such as touching the toes, jumping, stretching, and other moves that help loosen the muscles. Insist that your kids get complete rest and adequate sleep so they can recover from the stress of the sport. Consult with the pediatrician and coach andwork out a healthy, balanced diet plan that includes lots of nutritious foods including lean protein, fruits, and vegetables. Make sure your child eats regular meals and takes adequate fluids to remain hydrated. Explain to your kids that they must carefully follow the instructions and guidelines that their coach outlines. Ensure that they understand the importance of safety when playing. An important factor to keep in mind is that kids become so engrossed and focused on playing that they may overlook any sports injuries they get on the field. As a parent, you must keep a sharp lookout for any signs that indicate your child is hurt. These symptoms can include swelling of the joints, pain, and soreness even after resting well and consistent pain while playing or when at home. If you notice your child limping or indicating that the joints are “giving way,” get medical attention immediately. Avoid letting your children play until the injury has healed completely. This factor is especially important if they have limited movement in any joint. When you see them walking or using a shoulder normally, you’ll know that they are ready to go back to playing. If they insist on continuing to exercise, check with the doctor for movements that will not stress the injury further. Get a trainer to supervise the workouts. Make sure your kids gets the right nutrition that will help them heal faster. Help your child do all the exercises that the therapist recommends. These movements will help restore the complete range of motion and functioning of the injured joint or ligament. Your orthopedist might give your kids weight training exercises to do or any other workouts that can help build endurance but don’t aggravate the injured joint. Assist them in every way you can. With your doctor’s recommendations, you can do your bit at home by applying hot and cold packs, compression wrapping, and keeping the injured joint immobile and elevated. Given the young age of your kids and the fact that they’re still growing, most doctors will not recommend invasive measures to treat sports injuries that can alter their tissues and anatomy. Unless the damage is very severe, doctors prefer to avoid surgery that often involves long rehabilitation and the need to stay away from sports. Add to that is the possibility that the surgery could go wrong and cause permanent disability. As a last resort before surgery, your orthopedist might ask you to consider getting PRP treatment for sports injuries. PRP (Platelet Rich Plasma) therapy is a minimally invasive treatment that can help your kids recover from their injuries without the use of foreign implants and chemical injections like cortisone. The PRP serum is created from a small sample of the patient’s blood and has no additives save for epinephrine that is an anti-allergic medication. After creating the serum, doctors insert it into the affected area where it sets off a healing cascade. PRP contains a concentration of mesenchymal stem cells, growth factors, cytokines, and other healing agents that are a natural part of the body’s regenerative systems. Patients typically report seeing a marked improvement in the pain and ease of movement within a few weeks of getting the treatment. Considering that many top athletes of the world like Tiger Woods, Rafael Nadal, Hines Ward, and others have used the therapy with amazing results, you can rest assured that it is safe for your kids also. To help your kids with sports injuries, you might want to opt for natural treatments that are not only highly effective but also unlikely to cause any permanent changes that may affect their future growth and normal living. PRP therapy can shorten the recovery period significantly and have your kids back in the game in no time. Have you ever heard older mothers say that they’ve put on a bit of weight since they had kids, but that’s just what happens? Have you watched friends who used to be in great shape turn into women who never go anywhere without their car and rely on men for every strength-based household task? Life doesn’t need to be like that. You may have gained a few pounds during pregnancy; you may have struggled to fit in exercise during those first exhausting months with each kid; but you can get back in shape, and there’s no reason why you shouldn’t be fit and healthy at 40 just as you were at 20. What you need to do is establish a workout plan that fits in with your life. What do you actually need from a good basic workout? There are three things that you should be focusing on here: strength, stamina, and agility. To maintain good muscle tone, you should do strength-based exercise – anything from push-ups to lifting weights – for 30 minutes, three times a week. To build up your muscles, double the length of each session, and remember to work separately on each muscle group that you want to improve. For stamina, you should do exercise that raises your heart rate over 120bpm for 45 to 60 minutes, twice a week. For flexibility, you should stretch off your muscles before and after each workout, and at the start and end of each day. You can gradually scale up each part of this in order to keep your workout challenging, and you can also push yourself by switching to heavier weights or running uphill instead of on level ground. Working out doesn’t have to involve a lot of equipment, but there are some things that are well worth investing in. A wristband that can monitor your pulse is useful for keeping an eye on both your progress and your health during every kind of workout. Good shoes, T-shirts, and shorts should be a part of any workout plan, and it’s worth investing in good gear generally, from compression shorts to sports bras, if you’re going to get the most out of what you do. A simple soccer ball, exercise ball, and skipping rope will give you all that you need for lots of independent exercise at a very low cost. It’s quite possible to fit in all the elements of a healthy workout without leaving your home. Exercising when your children are present can be a great way to show them that it’s fun, and can get them to take an interest in healthy living. Simple, low-cost additions to your home, such as a pull-up bar fitted in a doorway, can help with your workout. While you might choose to purchase a treadmill, old-fashioned alternatives such as running on the spot, skipping, or dancing can be just as effective at building up your fitness. Getting out to the gym can be difficult if you’re juggling kids and other responsibilities, but there are ways to do it. Find a gym that’s close to your kids’ school or kindergarten so that you can pop in for a short workout after dropping them off, helping you to feel refreshed in the morning. If you’re working, try to find a gym close by so that you can work out during your lunch hour – many people say that this makes them feel much more alert in the afternoon – and have mini meals in your morning and afternoon breaks, which will better supply you with energy over the course of the day. If scheduling workouts simply proves impossible, there are still things that you can do by building the elements of a workout into your day-to-day routine. Walk instead of driving whenever possible, and run if you can. Scrub floors, walls, and windows the traditional way, using muscle power rather than letting synthetic chemicals do the work for you. Do Pilates exercises while sitting at your desk. Work on your yard – something children love to help with – and discover how digging can toughen you up. There’s a reason why our grandparents’ generation was leaner than we are today, and it wasn’t all about diet. Few things in life are perfect when you’re a busy mom, but your workout is something that you can still keep up, and you’ll really feel the benefit. Even if it seems exhausting to begin with, you’ll soon find that you’re more energetic and better able to do all the things that you want to do.